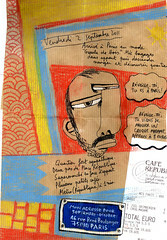 I am invited to an artist residency for two months in paris (september and october). i am posting on flickr most of the work (notebooks, paintings, etc.) produced during my stay. also, if you are in france, you can come to one of my two exhibits and three concerts. please send me a message for the full program (in paris, la seyne-sur-mer, arc-et-senans and draguignan). salam, i'll come see, with some friends, your work in Paris... where is it in paris and when please ? thanks sarah... for both the post... and your interest in my work!